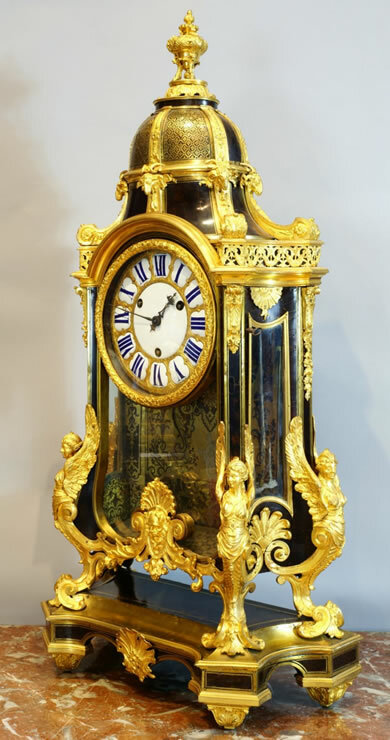 Louis XIV Boulle marquetry clock known as La Pendule aux Harpies ("The Harpy Clock") attributed to the Boulle workshop and designed by Jean Berain. The beautifully shaped tall upright case, with concave sides, rests on a corresponding incurvated base raised on short ormoulu acanthus-decorated feet. The case swells at the bottom following the curve of the four winged harpy figures, resting on scrolls, which support the case. Above the thirteen-part enamel dial, a complex top rises composed of a concave support mounted with five ram-headed ormoulu volutes, below a dome beautifully decorated with Boulle-work trellis enclosing acanthus motifs. At the crest is an ormoulu tripod resting on an acanthus plinth. The back of the glazed interior has a panel of fine Boulle marquetry with original engraving. The clock is mounted with well chased ormoulu with original gilding. An engraving of a clock by Jean Berain shows a nearly identical composition of harpies. The composition of the Boulle marquetry panel is very close to Berain engravings and shares many of their idiosyncratic motifs. From the workshop of A.-C. Boulle. Three train quarter strike movement by Thuret. Escapement replaced.